For many businesses, slower summer months are the perfect time to conduct a market analysis that points out the Strengths, Weaknesses, Opportunities and Threats to your company. This SWOT analysis is the first step in planning a marketing strategy with print and electronic strategies that will promote your company. Keep in mind your relationship to your competition regarding products, pricing, market share and other essential elements that are revealed in the SWOT analysis. 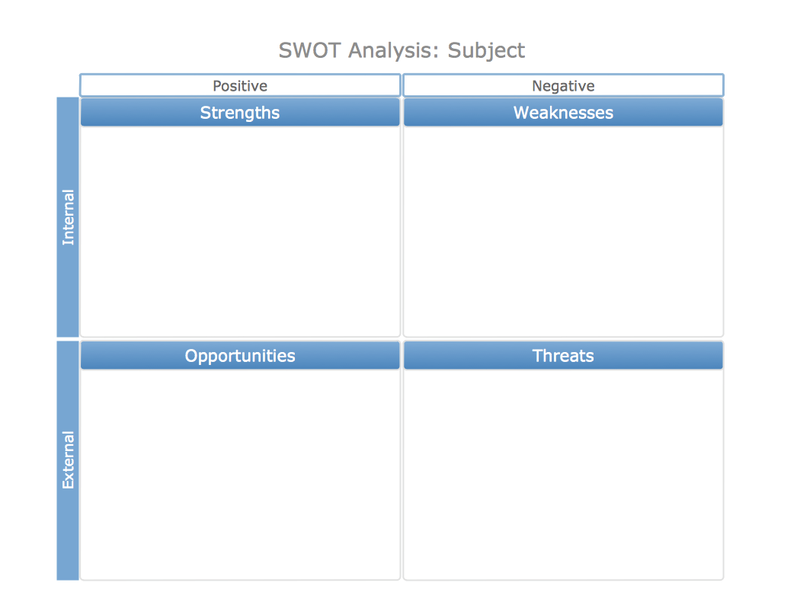 A SWOT analysis can be recorded on a simple chart such as the template below where the page is divided into four quadrants showing Strengths, Weaknesses, Opportunities and Threats. Preparing the analysis will allow you to see your company clearly and perfect your brand message to project how your company excels compared to the competition. 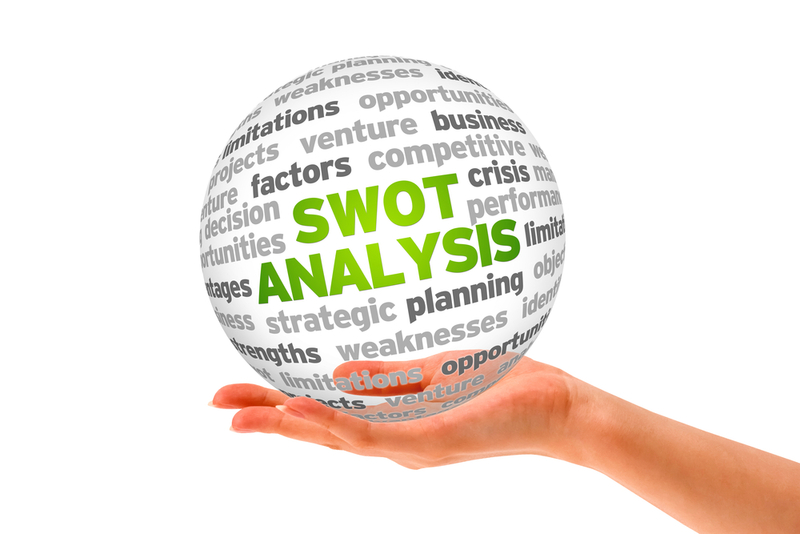 Begin your SWOT analysis on a positive note by listing all the ways you compare favorably with others in the field. This step will define your USP (Unique Selling Points) that put you head and shoulders above the rest. You might have a broader product line, more experienced personnel, an advantageous location, specialized knowledge and advanced technology, or you may offer higher quality, faster service and a greater value. Be honest about areas where you might improve. Think about your gaps in capability, whether you lack the appropriate staff or suffer from a narrow range of product lines. Your problems may be financial, or you may be experiencing a morale problem among your employees. Remember that identifying problems is the first step toward solving them. Now you are back to the positive side of the SWOT template. Brainstorm opportunities that exist to take advantage of openings that can grow your business. If you are a retail shop, perhaps a new residential development is planned nearby. Technological innovations may be available to streamline your business. Or maybe your closest competitors have become vulnerable in a way that will make it easy for your company to surge ahead. In business, sometimes it seems that there is no end to threats from external and internal sources. Identifying existing and potential threats can allow your company to become proactive to neutralize negative forces before they impact your business. Threats may come from new legislation such as strengthened environmental regulation, or you may be having internal problems such as the loss of a key staff member. Jot them down on your SWOT template and address them one by one. Once you have completed your SWOT market analysis, you are ready to design a strategic marketing plan to address those issues, including print and electronic media strategies. PCA Delta is an established multi-million dollar commercial printer located in Pompano Beach, Florida. Our facility offers the latest technology, an onsite graphic arts department and a wide range of capabilities for true custom printing that can brand your company and support your marketing efforts.